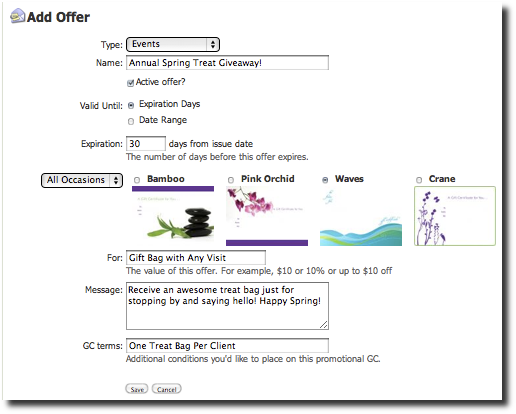 just for fun - create an offer for one person, or send a treat to your whole email list! Basically, they are a special kind of Gift Certificate, and they show up in your GCs tab as "Promo GCs", with "Issued" or "Picked up" in the Balance column (and "Redeemed" once the client brings it in). 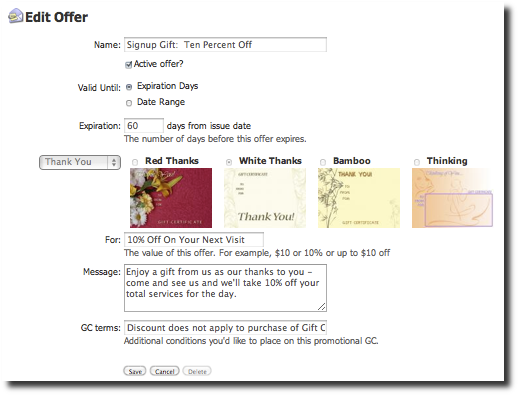 The "message" is what will print on the Offer GC, just like a gift message to any recipient, so make it fun and gifty! 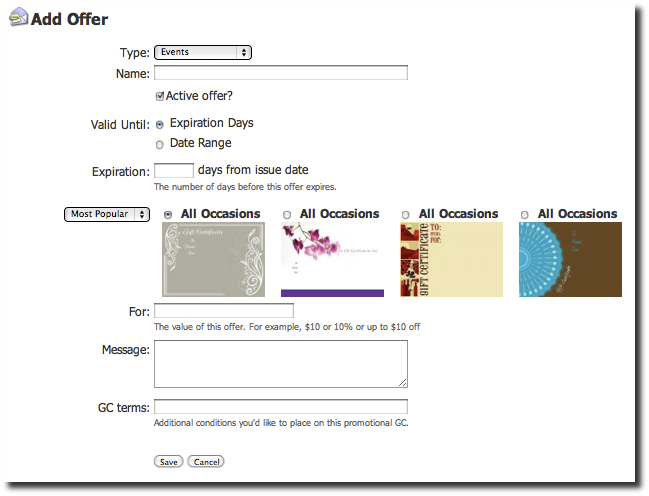 You can refer to this offer in emails, or have it show up on your website as part of your Events listing. When editing or newly creating an Event, you can attach a brand-new offer to that event which has the same time frame and is automagically shown on your Events page (or widget). Simply check the box in the Event that says "include Offer". 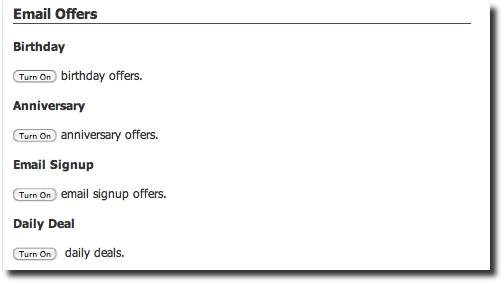 From the drop-down list you'll see any currently active Instant Offers available, or simply choose "Create New Offer" and you'll be taken to the Offers detail page with a new Instant Offer partially created. Fill out your details and Save to come back to your Event, and you're all done! If you create an Email Campaign from this event, your Instant Offer is automatically attached - super nifty! One-time Offers are intended for attachment to Email Campaigns. They are similar to Instant Offers, but there are no Events involved in the flow. Why would you want this? Simple. You decide that this Friday you'd like to send a "Happy Friday" email to your clients and attach a bonus to the email. You don't want it advertised on the website or "out there" for very long - you only want it sent in an email, for a one-time gift. Signup Offers (and Birthday/Anniversary!) - like the big glass fishbowl on your front desk, only better! Signup Offers are even better than the old fishbowl - collect your clients' contact information and OFFER back to them a special treat of your choosing - a discount on an upcoming visit, a free gift, anything you'd like. They receive it as soon as they confirm their email address, in the form of a one-time-use Instant Gift Certificate. Save and that's about it - your new clients will receive the email you customized once they've signed up, and they will get a link to the Offer as your way of saying thanks!